Now that the majority of the mechanical work has been done on my 1927 tudor, I am now in the process of tearing things down and repainting them. The front fenders and running boards are in pretty good shape; however, the rear fenders needed some body work done and I had to totally replace the splash shields with new ones from Rootlieb. One splash shield was in such bad shape that someone in the past had brazed it to the running board. Many of the bolts, on both sides of the car, were missing that attached each of those pieces together; some broke off; others had squarenuts, which made me question if those were original or not. If I were to replace all of the bolts, can someone please guide me which ones should I order from one of our vendors? part numbers would be helpful. Thanks. Contact RV Anderson.He has those bolts made up and can help you.See suppliers on the MTFCA home page. The nut and bolt on my 27 where 1/4 20 one inch long with square nut. The head on the bolt is thicker than normal and uses a 3/8 size wrench. My car had never been apart. 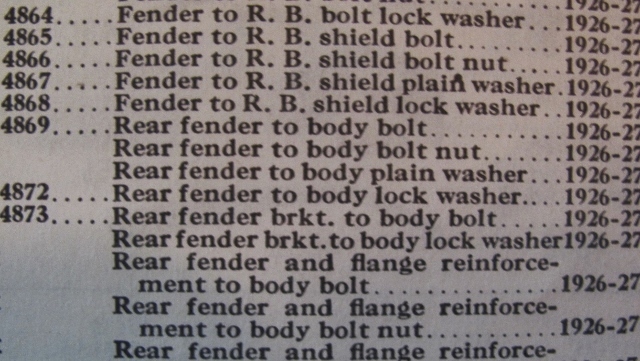 Page 53 of the September 1925 Ford Service Bulletin shows slotted head screws with flat washers attaching the front fender and dust shield together. Please look at Figure 79 with a magnifying glass! This is what makes life interesting! Perhaps another topic would be the correct fasteners to use in assembly of the 26/27's. I think we would need a lot of members to look at their cars if they think they are original and state just what fastener was used to hold the splash apron to the front fender. In this case perhaps the width across the flats and the head height, might tell the more modern fasteners from the older ones. I took apart and restored a very un-molested Nov 1925 mfg runabout pickup. The front fender to splash shield bolts were just like the early photo in the Service Manual version 1926 which now had pictures of the Improved Car. And the same single slot machine screw used to fasten the tail lamp bracket to the fender. These were single slot machine screws with hex nuts over flat washers. Later these fasteners must have changed, as the these bolts became 1/4 x 20 5/8" long hex head bolts with a high head than typical. 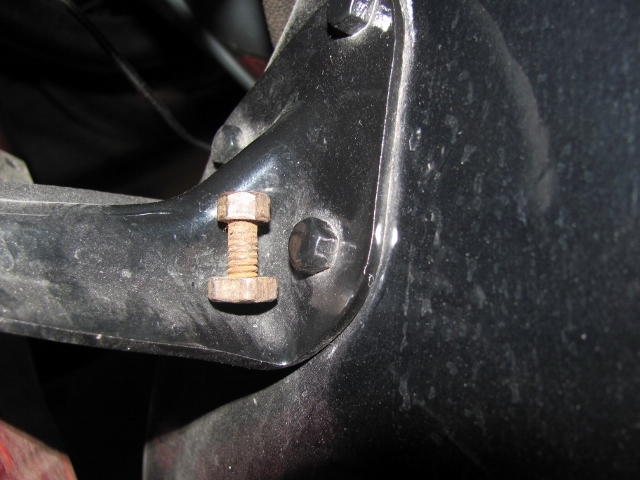 Same fastener used for body structure bolts in the closed cars too. And used in late '26 for tail lamp bracket to fender. The hex head bolt and nut. Used later for fenders and stuff. Parts books show some info but no pictures. Now I don't know my Model A fasteners, maybe someone can check on what they are like, because the last Part Book for T parts (Aug 2, 1928) gives alternate factory number for these part numbers on these fender fasteners. The last 1927 Wholesale Parts list gives Model T factory numbers. Added info from parts books. Shows also that plain and lock washers were used. I think we were talking about the front fender to splash shield fasteners. I believe you are listing numbers for the front fender to running board fasteners which perhaps are different! I think you are just trying to keep us on our toes! On my 27 the bolts all the same front fender to splash shield and to running board. Rear fender to running board. They had two flat washers and a lock washer. My cars engine was built October of 26 and car was sold in January of 27. Sold in Columbus, Ohio and most likely built at the plant there. The bolts my have been less then one inch I don't remember. I used one inch bolts when put back together. I went out and looked at the very early 26 touring (made in calendar 25) The splash apron to fender bolts are 1/4 inch NC straight slot,round head bolts 5/8 inch long with 2 flat washers and square nuts. The car is very rusty and they appear to have been there "forever". Then I looked at the late 27 touring (next to last month of production) It uses thick head 1/4 inch NC bolts 5/8 inch long, with square nuts and 2 flat washers. The heads are 3/8 inch wrench size, and the square nuts are 1/2 inch wrench size for either the early or late car. A normal square nut for a 1/4 inch bolt is usually 7/16 inch wrench size. The square nuts also have "rounded" corners, a modern square nut does not have "rounded" corners. 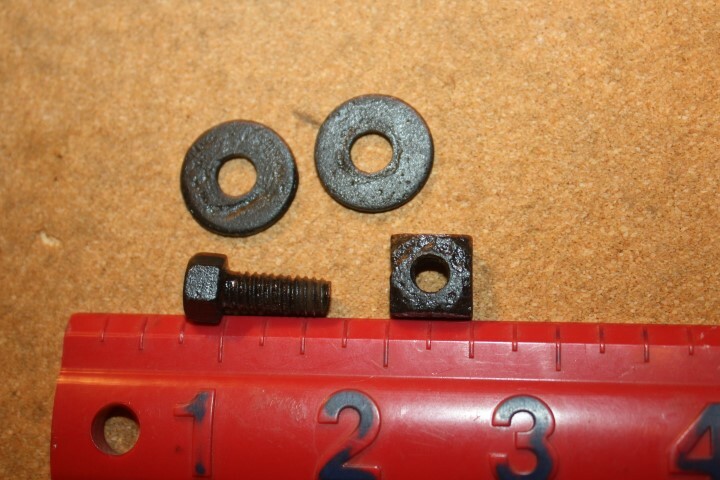 I went and looked thru my parts stash and found a correct thick head bolt nut and washer like used on my 1927 touring. I will post a couple photos of them . So it appears that the early production used round heads (like in the service bulletins) and then sometime later changed to thick hex heads. The square nut didn't come with the set I bought from Langs. My next question is do I need the other sets? I am going to have to replace some as a few of the bolts broke off because of rust. I am a bit confused on the difference between Part 4813B and Part 4818-19B. Thanks. 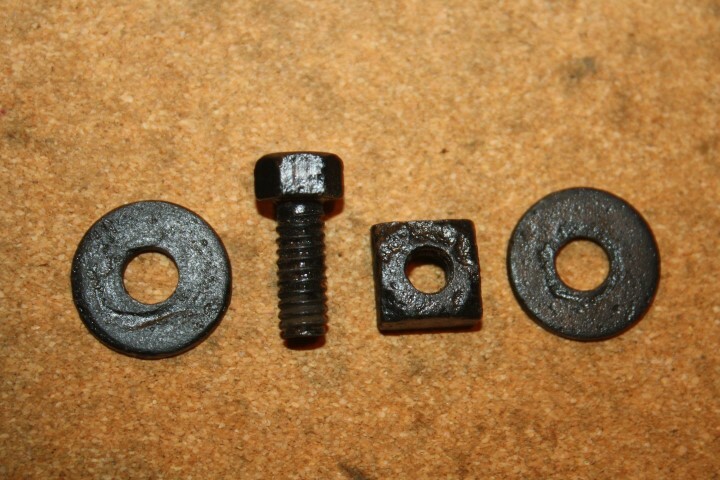 Running board bolt set. Original style, For original running boards ONLY. Please confirm, if you know, which sets I need to purchase to keep it as original as possible. If I can get away with a hardware store bolt and grind off the markings, that would be good to know, too. Thanks. I bought a handfull of those 1/4-20 bolts with the high 3/8 head from a Model A supplier at Hershey once. They use them a lot to put the body panels together on '25s. The A's use them for attaching the gas tank to the cowl I think. Very interesting thread, thanks Jim. I was going to have to ask about all of this eventually. My September 1926 production Runabout has the 1/4 x 20 5/8" long hex head bolts with a high head on the front fender to splash apron. I was actually trying to find the slotted head screws that appear in the manual, but now I know that what came on the car is original and correct for it. Many of the other fasteners around the running board are mixed with modern hardware so I am interested in knowing about these as well. I bought all the hardware available from Lang's, but if anything needs to changed to keep it original, I would like to know about it. If this keeps up you may need to write a restoration guideline book, just for the 1926/1927 models following along the lines of the Model A Ford one! I know many people do not care what changes were made, and this is fine. However, if the changes are documented one can get a better idea of just when in the year the vehicle was made. As a side note, I was also going to change my fasteners to the hex head ones, but now that others have the slotted round head screws I will leave them as is! I got my vehicle all in parts so I am using the service bulletin stuff as a guide when possible. Perhaps with more research one can add the fastener type (round slotted head or hex head bolts) that holds the splash apron to the front fender as another means of identifying the early 1926 production from the later 1926 production! 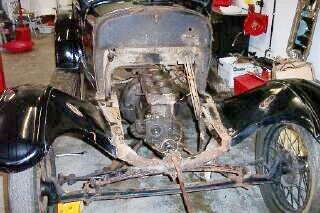 The problem I have with the series you are running on the 1926/1927 is that soon when the snow falls, I will not be able to get out to the shed and look just what is on what I believe is an early 1926 Roadster! I think you are doing a fine job with this series, and I hope that people respond with what is on their vehicle, so that we can truly get a better idea of all the changes that were done even though Henry must have known he was going to start with a complete new vehicle in a few years! Donnie, my Roadster has one early door and one late door! I have no idea if it came from the factory that way! It would be interesting if any other owners have vehicles with different (early/late) components on the same vehicle. If indeed it really came form the factory that way, I would think it could reduce the range of months it could/would normally be built in. However, I guess there is also the possibility of an old door laying around in the plant, and used for a vehicle near the end of production! It also has an early rear brake backing plate on one side and a late rear brake backing plate on the other! I got concerned and looked at the sill plate area below the door when it is open and my roadster has the alloy metal still plate on both sides, indicating an early model. If I found an early and late on different sides I might think the vehicle was assembled from one early car on one side and one late car on the other side! (just kidding). Arnie. I am still working on the "a study of" series.... It will take time. I just started thread # 6 tonight. Some of these threads about parts questions tend to "morph" into a study, but that helps find more unique parts. If I live long enough to finish the studies, I want to have the whole study organized and try to print a simple book with the findings. May never happen but Im not dead yet.... As to your doors being different, It could be when the new style later door came into use, and they were using up the last of the old style, a few cars could have been built with different doors. The only real noticeable difference is the grommet around the side curtain rod hole. May be unlikely but I can see where it "could be". The rear end, is more than likely just a earlier rebuild. "BUT" when a part became obsolete, and a later part was able to replace the earlier part as is, a dealer (or any mechanic) who was repairing a damaged rear axle tube (for example) needed a replacement tube, he had no choice but use the new style. There are other differences in the doors. The inside metal panel has four holes in it. The early ones had small diameter holes. The later ones had larger diameter holes. Also the bolts that secure the door hinge to the door used a nut plate on the early ones, and the later door had clearance cut in the inner metal door panel so one could access the square nuts used to fasten the door to the body. There are perhaps other differences. Arnie, I was just pointing out the difference in the doors that would be noticeable on a finished car. All the differences you mention would be hidden behind the door panel.